The leaves are turning brown and the weather is turning chilly at Nana's home in Northern California. It’s the time of year that's perfect for soups that offer warmth to counter the cold outside. 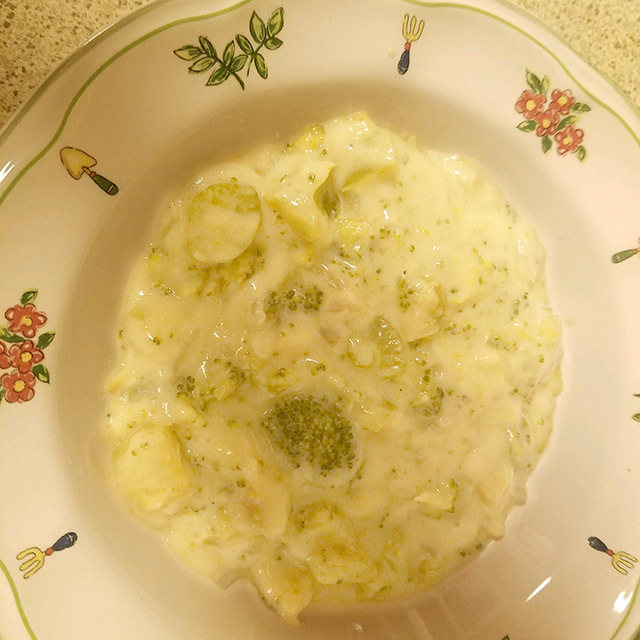 Nana's youngest daughter, Cindi, decided to prepare her mom's Cream of Broccoli Soup (variation 3) in a slow-cooker (crockpot). The results were a luscious, thicker version of the recipe, shown at the right. Cindi, a vegetarian who loves vegetable soups, put her own distinctive spin on her mom’s recipe. The soup was stirred occasionally as it cooked on high in a slow-cooker for about 2 hours. Corn starch was added at the end to give the soup the thicker texture Cindi desired. Nana so loves Broccoli Soup that she offers three — YES THREE! — variations of the recipe. Give one a try! Nana's Recipes now have about 2750 Facebook "likes. " That's an increase of 1000 in the last 3 months! Much of the new interest still seems to stem from a Pinterest.com post highlighting our Jell-O recipes! If you love Jell-O, check out all nine of the recipes on our Salad page. We'd love to hear how you found Nana's Recipes — please post your story on our Facebook page. Stay up to date with new additions to Nana's Recipes by adding your e-mail address to the quarterly "What's Cooking" newsletter mailing list. There are about 300 people signed up. I promise never to share your address with anyone. Want to Play Nana's Game? Play the online game that tests your knowledge of the Nana's Recipes website? It's a blast!